Krispy Kreme reveals 2018's holiday donut selection which includes the new Ugly Sweater Donut and is available now at participating shops in the US and Canada. The Ugly Sweater Donut is a shell donut dipped in green icing, sprinkled with confetti candy, and decorated with reindeer and penguin candy pieces. 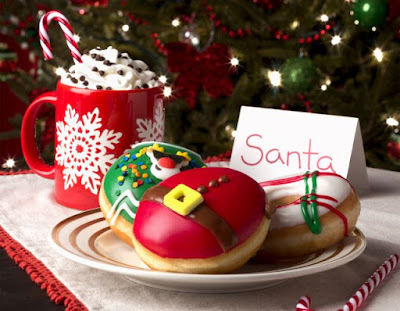 - Santa Belly Donut - A chocolate Kreme-filled shell donut dipped in red icing and decorated to look like Santa's belly, complete with an icing belt, buttons, and a candy buckle. - Holiday Plaid Donut - An Original Glazed Donut dipped in icing and decorated in a red and green plaid design. - Chocolate Iced with Sprinkles Donut - A chocolate iced ring donut with festive sprinkles. In addition to the seasonal donuts, Krispy Kreme is also serving Peppermint Mochas for the holidays. Available hot, iced, or frozen, the drink features espresso, milk, dark chocolate, and peppermint syrup, topped with whipped cream and mini chocolate chips. Krispy Kreme's 2018 holiday menu is available through December 24, 2018.